Why worry about server downtime? Our remote data backup services offer a redundant infrastructure with real-time fail-over guarantees at least 99.9% uptime by our industry-leading Service-Level Agreement (SLA). Since all servers, applications and files are housed, managed with our offsite data backup services in our secure data center, your local computers' resources are scarcely used and are no longer a burden. Nothing runs or is stored there. This centralized system allows for quicker, more efficient management and creates greater flexibility in response to changing business needs. 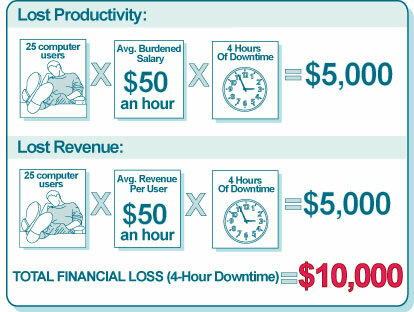 How does computer 'downtime' affect your bottom line? You are finally unburdened from the daily grind of troubleshooting IT issues and installing software. Your IT manager is better equipped with high-performance technology and the freedom to focus on strategic initiatives that help grow your business.